Focus Display Solutions specializes in offering LCD engineering support for designing custom LCD display modules for OEM manufacturers. Our experienced engineering team has design experience in developing custom display modules based on your specification. Focus Display Solutions (also known as Focus LCDs) believes that new product designs work best when engineers are working with engineers. 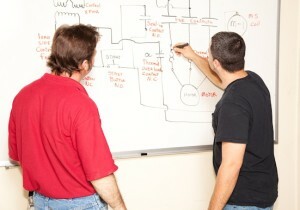 Our engineering experience allows us to recommend alternatives to lower your cost and improve power efficiency. Let’s face it, custom LCD displays are complex devices. When it comes to support for your custom LCD, you need to be aware of the constant changes taking place in the display industry. Display technology is always in flux and changes at a rapidly increasing rate. You do not have time to stay abreast of all the updates and new display breakthroughs. You need a trusted partner in the LCD business that is focused on all types of LCD technologies, and how to incorporate them in your product. Many LCD suppliers offer not only LCD’s, but also capacitors, PCB’s, active memory and other electronic products. LCDs are a different animal then other components and the design engineer should be working with an engineer that is 100% devoted to LCDs. We have always narrowed our focus to LCD modules. Focus LCDs offers in-stock LCD displays with full engineering support. Focus Display Solutions specializes in offering US-based engineering support not only when your shopping for character, TFT and segment LCDs, but also for a custom LCD display. Our experienced engineering team has design experience in developing custom display solutions to meet or exceed your design specification. We are located in Chandler Arizona and offer phone support from 7:30 AM to 4 PM Arizona standard time; Monday through Friday. We make every effort to answer the phone on the first ring. We want to be your primary LCD supplier and will make every effort to earn it. We start the design of your custom LCD display by asking you what you need. Our display designers begin the process by learning all parameters of your project including power budget, operating temperatures, display life-time (half-life), EM noise issues, size constraints, Tooling (NRE) budgets, target dates for proto types and production. Whether your display is a TFT LCD display, character LCD display, graphic LCD, a color LCD screen, or a completely customized LCD display solution, we strive to meet and exceed your expectations. Focus Display Solutions understands the custom LCD display manufacturing process necessary to optimize the custom display solution for your product. To learn more about our custom LCD displays, contact Focus Display Solutions and talk to our custom LCD Engineering Support team today.